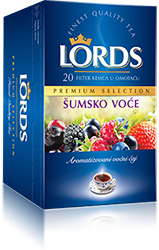 “Lords” forest fruit tea is a combination of fruit flavours such as apple, pear, aronia, blueberry, raspberry, bosel and hibiscus flowers. It is refreshing and sweet tasted potion where the abundance of components can be recognized. We recommend it fresh prepared, at any time of the day. Pour 200 ml of boiling water over the tea bag and cover. Allow to infuse 5-10 min. and then remove the tea bag. Sweeten according to taste.